​We are fully committed to the education and development of coaches through the coaching education pathway. 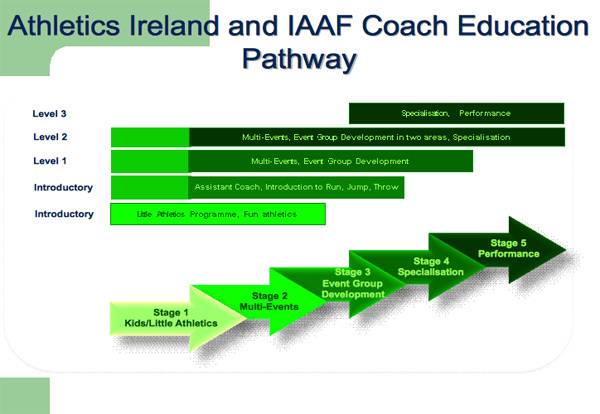 The coaching education pathway is based on the Long Term Athlete Development model supported by Coaching Ireland and the IAAF as the internationally accepted standard for the development of athletes and coaches. The coaching syllabi was developed by reviewing best practice of coach education in a number of sports and some of the most progressive coach development programs in countries such as the UK, Canada, Australia and New Zealand. It is important to remember that the formal coach education system is just a starting point. There are many event coaching workshops and seminars to help coaches develop especially if you are interested in a particular event area. For the full coach education calendar go to the coaching homepage .